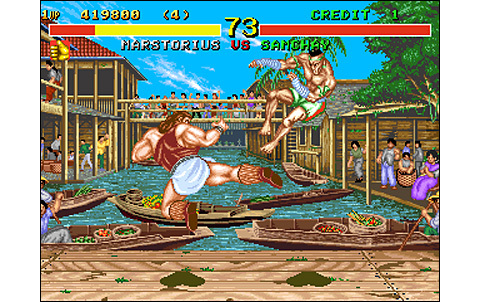 If the graphics are not as beautiful as those of Fatal Fury Special or Super Street Fighter II, they are still very pleasing to the eye, with a nice variety of environments using a beautiful color palette, as well as well-drawn characters. 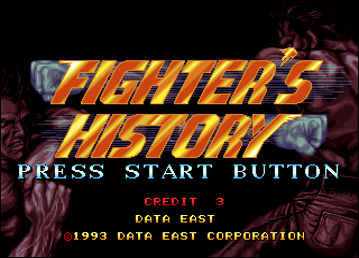 A little more finesse and details would have had Data East matching the tenors of the genre, but Fighter's History is not doing so bad. Ditto for the animation, which is fast and relatively fluid. 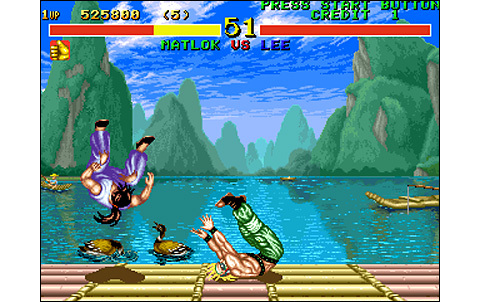 We are even entitled to fairly lively backgrounds (effects on the water, the classics onlookers who gesticulate, etc.). The only small thing is some postures of certain characters are a little ridiculous, but hey, Data East has a great sense of humor, and it's not so bad, in the end. 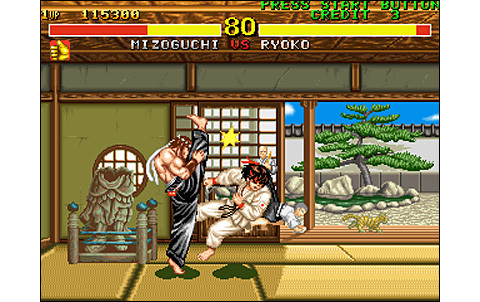 The soundtrack is much more casual, with some nice melodies, but most of them are quickly forgotten. 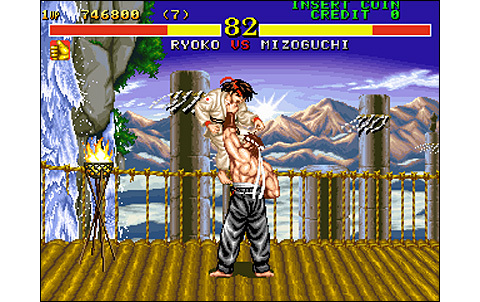 The impacts of blows are very similar to those of Street Fighter II, while the acting of the voices for the characters and even the speaker is a little overplayed. You have to hear Jean (D'Jin) scream "la belle rose!" which with the Japanese accent is sounding like "la vella wozzz". 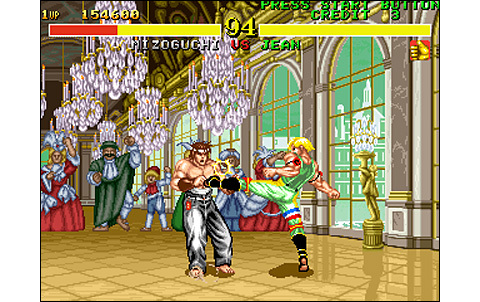 The atmosphere and the "personality" of Fighter's History are therefore firmly the most assumed kitsch, but somewhere, it feels good to see a fighting game that does not take itself seriously. 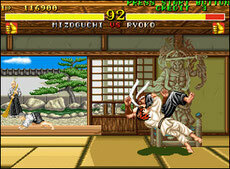 Viccom will go even further in this vision of things, with the remarkable Fight Fever. 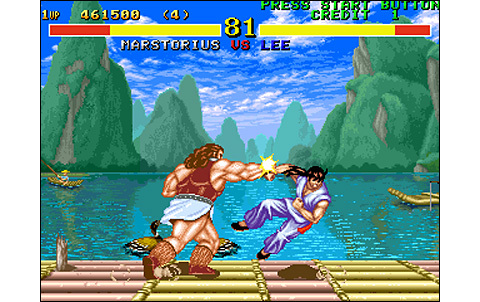 Data East proposes a six-button gameplay, with combos, throws, stuns, special moves, in short, all the basics of a versus fighting of this generation. 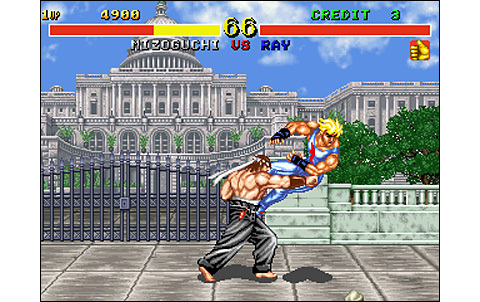 Except that Fighter's History, to really weigh in the balance, should have been released in 1991. 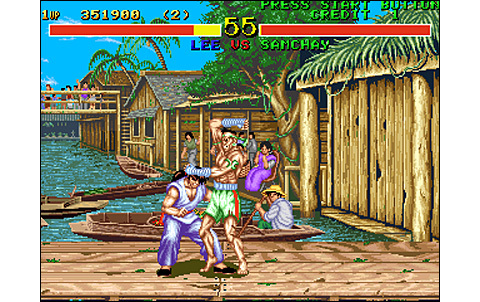 Two years later, it remains a game of good quality, but exceeded by all that comes out of Capcom, SNK and Midway, at that same era. 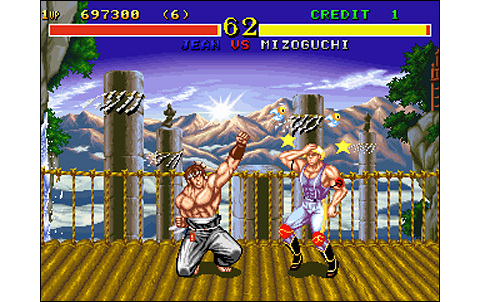 Still, Fighter's History is endearing, and if you take the time to dive in and progress a little, the pleasure is there. 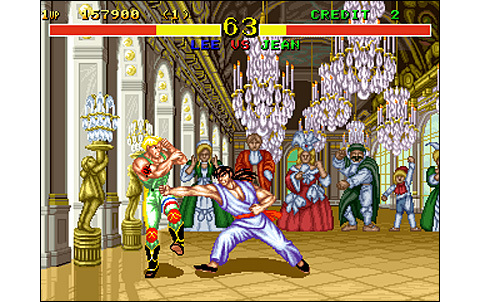 The stun system (groggy fighter) is original because related to a clothing item. By carrying the blows as much as possible on this particular part, it weakens and blinks. 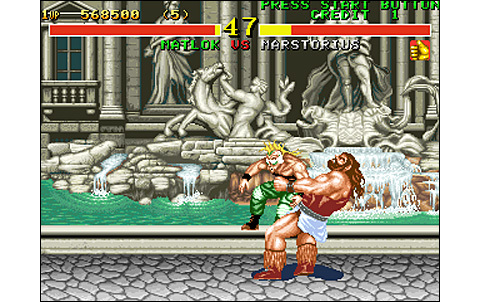 When you finally destroy it, the character is stunned, leaving you the opportunity to make a great combination and ruin his health bar! 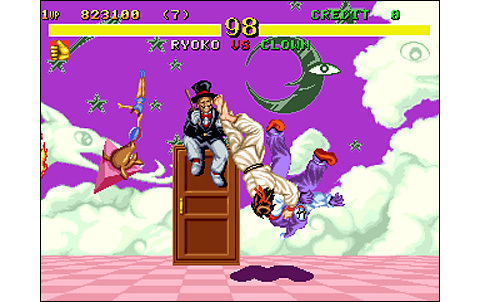 Most archetypes of fighting characters are portrayed and inspired by various other VS softs, except of course for some rare birds, such as Karnov or Clown, which Data East alone could incorporate into a fighting game. 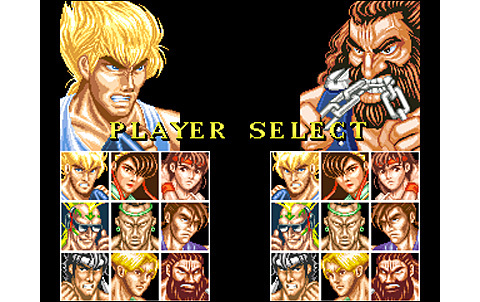 Matlok the punk looks like Duck King, Marstorius the wrestler is no other than a clone of Zangief, Jean the French fag (necessarily) is an effeminate Guile, Samchay is a poor Joe Higashi, Ray is a mix of Ken and Terry Bogard, and Mizoguchi could come straight out of Art of Fighting... but it's one of the most charismatic characters, so it's ok. You really must see the endings of the fighters to understand that Data East is really on the second degree with its game. Some are very funny, and frankly, again, it's still very nice to play a game more than decent, who does not take himself seriously. 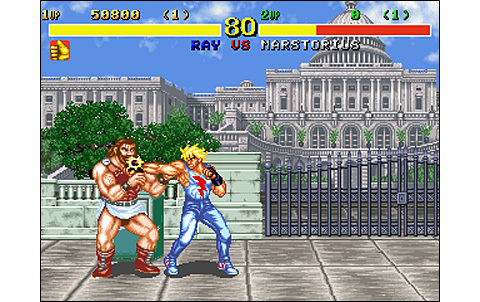 Fighter's History might be plagiarizing the most illustrious VS fighting games, it is nonetheless a good title of the genre, with a very endearing personality. 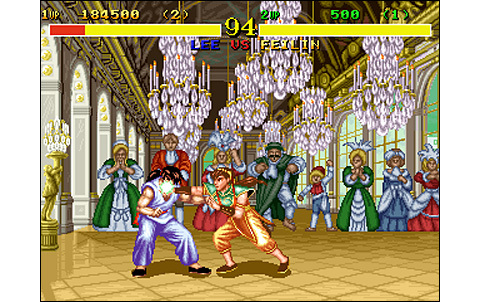 The backgrounds are simple but beautiful, and the characters are finely drawn. And if you love kitsch, you are going to be served. 3-D animated ground, a decently decomposed animation with a good game speed, in the standards of the era... without being an absolute benchmark, FH still packs a good animation, very nice to see. There is nine playable characters and two Bosses. You can find better in 1993, but it's still more than decent. 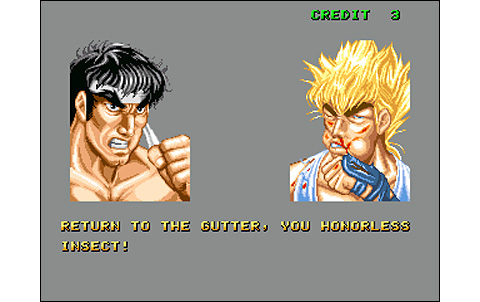 Humor and good atmosphere in the game do have players coming back willingly to it. 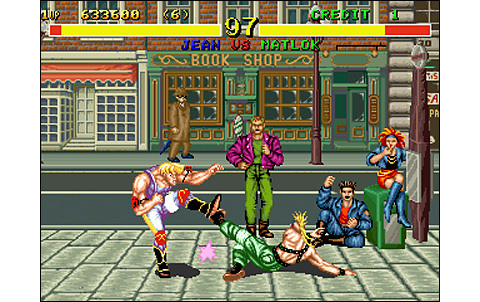 Plagiarizing shamelessly Street Fighter II, Data East manages to produce a pretty good VS Fighting game, but with outdated game mechanics and an unbalanced roster. 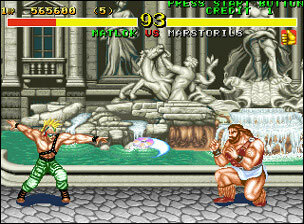 If it was released at the same time of Street Fighter II, Fighter's History would have been a very serious rival to it. But two and a half years later, it's only a second knife, but still a good second knife. 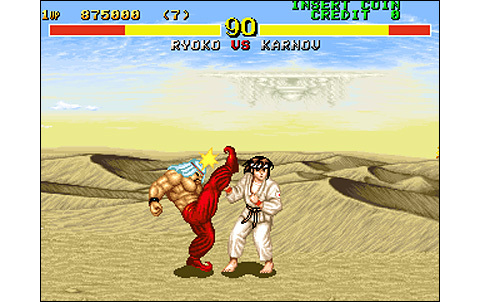 There's the next episode, you lucky Neo Geo players: Karnov's Revenge, aka Fighter's History Dynamite! This one is slightly better than its elder and play with four buttons instead of six. Released one year later, they are very similar to each other, exactly in the same kitsch delirium.